Say goodbye to Satisfries. Most Burger King locations are phasing out their lower-fat alternative french fries for a good reason: they weren’t selling. How they got on the menu in the first place, however, is a cautionary tale that could save you from an expensive mistake of your own. Burger King created Satisfries for noble reasons: regular fries deliver 340 calories, 15 grams of fat and a whopping 480 milligrams of sodium. So, why wouldn’t customers flock to a smaller box of crinkle-cut fries with 70 less calories? Because, that’s not why we buy fries. How often did you gleefully snarf down veggies as a kid after your mother said, “because it’s good for you.” Same goes for Burger King; two-thirds of BK’s franchisees are now phasing out the fries no one is buying. Don’t be The King. Be a chicken instead. Burger King isn’t alone. McDonald’s just reported disappointing sales for another quarter—that makes six out of the last eight. What’s worse, sales have been flat or falling for the most of the past year. Insiders blame the myriad of menu additions and changes made in hopes of appealing to changing tastes. It’s the Satisfries fail in different clothing. The Wall Street Journal reports that 5.2% of millennials are leaving the Golden Arches for perceived healthier fast-casual options like Chipolte. McDonald’s response? “We serve food in wraps too.” Seriously. Meanwhile, Chick-fil-A is booming. While McDonald’s cranks out $2.6 million dollars in sales per store, Chick-fil-A stores generate $3.2 million, according to 2012 QSR totals. And, they do so operating one less day a week. You can’t get a burger at Chick-fil-A. You can’t get a latte. You sure as hell can’t get Satisfries. But, you can get a darned good chicken sandwich. Chick-fil-A isn’t chasing trends or cutting new ground. They are, instead, masters of one thing. Therein lies the lesson for you. 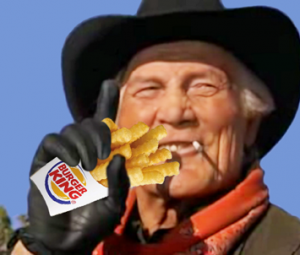 Curly (Jack Palance) summed it up in City Slickers: the secret of life comes down to ONE thing. One thing separates the masters from the mediocre. What is the one thing for which you’re known? What’s your one point of mastery? Here’s a hint: customers probably already choose you because of it. My clients understands their one thing—I see to it. Their point of mastery is a potent weapon. Our messages reinforce that one thing for which customers already demonstrate affinity. We sell what customers are buying. Seems simple, right. So, why do so few do it? This marriage of message and mastery is an example of signal theory in action. Saying and doing one thing well focuses the message. It creates cues that generate trust among your customers: you walk your talk. While there’s a thrill in cutting new trails, what’s exciting to you is often risky to customers. The tried-and-true may bore you, but it comforts customers. Consistency breeds content. For all its problems, McDonald’s one thing in customers’ minds is still french fries. Which is another reason Satisfries failed: Burger King attempted an uphill attack on McDonald’s one thing. What is the one thing you already own? Are you actively selling it? Since one thing is what you’re communicating, communicate that one thing. Just say no to adding another thing: One ad. One message. Do it clearly. Do it consistently. It signals confidence. It builds customer confidence. It drives competitors crazy. Want to make that happen? My team of specialists can help. Let’s talk.